Our DRESSAGE PADS are made for dressage saddles up to 18". Our dressage pads are contoured with wither-relief but will fit on horses with regular withers also. Our standard pads measure 24" along the spine, 25" along the middle and and have a drop of 23" down the front and 21" down the middle. Some pads are available as oversize OS Or XL, measuring 24"-24.5" along the spine and a 26" drop down the front. There are girth straps and billets have velcro closures. Our pads are made to last: We use a heavy weight cotton underside, 3/8" foam center, quality top materials and heavy black webbing on billet loops, girth straps and binding. They will also fit under most Saddleseat/Cutback saddles but the straps will have to be removed. Special orders marked with S/O are available but will take one week to make. Care Instructions: Machine wash cold, no bleach. Hang-dry. 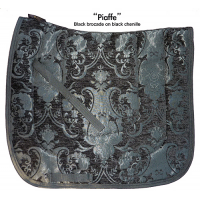 Dressage Pad "Big Red Flowers"
Dressage Pad "Black and White Design"
Dressage Pad "Black Blue Lime Hawaii"
Dressage Pad "Black Gold Horseshoe"
Dressage Pad "Blue Orange Flower"
Dressage Pad "Burnt Orange Flower"
Dressage Pad "Bursts on Brown"
Dressage Pad "Bursts on Grey"